Enjoy those cool summer nights with this stylish Davenport Collection outdoor fire pit set from RC Willey. This fire pit collection comes with a durable fire pit with wicker accents and adjustable flame and 4 patio rocker chairs. Overstuffed for maximum comfort, these chairs will make it easy to relax outside in your backyard or patio space. Sunbrella fabric cushions and a cast aluminum frame make this set as durable as it is stylish. Relax this summer and let the good times roll! Sunbrella Fabrics are saturated to the core with highly UV-stable pigments, making them Fade Resistant even in the sunniest yards. When rain is on the forecast Sunbrella Fabrics are ready for it. These fabrics have been engineered to resist mold and mildew, but should mildew and mold occur, Sunbrella fabrics can be easily and safely cleaned with bleach. This Davenport Collection Patio Rocker Lounge Chair from RC Willey is the perfect place to spend those dog days of summer! 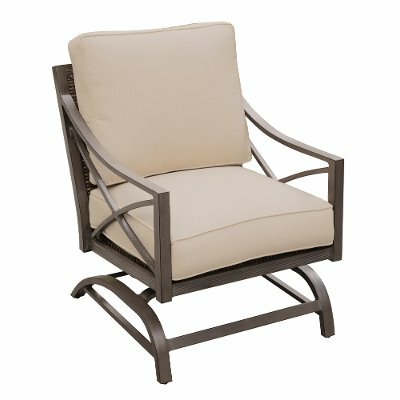 This Patio Club Chair features a cast aluminum frame powder coated in a stylish tan finish and an overstuffed Sunbrella Fabric cushion. This chair will bring you years of relaxation and comfort in your outdoor living space. Kick your feet up and relax this summer, RC Willey can help!